From several weeks ago i tried to turn on tft lcd by fbtft drivers but failed. I confirmed that the spi is working by testing mcp3008 adc on the raspbian image. I am using hy28b and waveshare22, each are 2.8in and 2.2in tft lcds for raspberrypi. and 2 or 3 gpio ports for reset, dc, led, etc. At first I compiled kernel and fbtft driver modules and installed on bananapi. After rebooting, I did insmod spi-sun7i, fbtft, fbtft_device modules. Then I tried to start X window through the following command as you know. I own some hy28b TFT touch monitors and use them with notro fbtft drivers on Raspberry Pi. Like you, I could also confirm SPI works on the Banana, but I couldn't succeed with the LCD. But the sunxi toolchain couldn't install on my Linux computer. So, I'm stuck. I confirm that it's possible with this SoC (i wrote the blog post on pwar.fr ( http://blog.pwar.fr/2014/05/19/t ... -sur-un-olimex-a10/ )). I tried on raspbian v 3.1, but resulted in failure. Then I also had tried to build kernel and drivers on ubuntu 12.04, but same result too. I think olinuxino, which uses A10 cpu, has not same core with bananapi's A20. Moreover bananapi's spi kernel driver is spi-sun7i.ko made by lemaker team, but olinuxino or cubieboard may use a different driver as spi-sunxi.ko. During insertion of driver modules, the fbtft drivers and GPIO ports for reset, dc, led were well recognized. Anyway, thank you for the replies. Many thanks for the details and for testing it. Wow, Great! 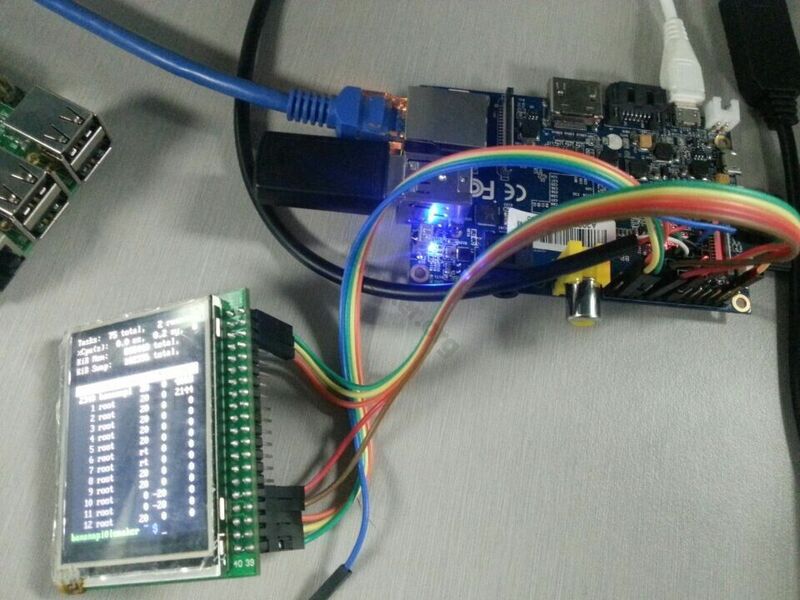 Actually today I also succeeded to turn on the lcd with comment of the fbtft developer, notro. However, I still could not load the touchscreen driver ads7846 with the following command. Do you know what problem is? Yes. Our engineer huangchenxinyu contacted notro, and discussed with him on the issues 77 thread. We will keep trying to make the touch screen work.